IRISH boy band Boyzone arrived in Scotland with a bang yesterday – quite literally. The 90’s pop group, who are in the country as part of their comeback tour Back Again – No Matter What, joined Jamie ‘The Cannon’ Shannon as he fired the world-famous One O’clock Gun at Edinburgh Castle. The boys were in town promoting their upcoming gig at the castle on July 18, a performance which will form part of a summer of high-profile gigs gracing the capital’s iconic venue, including Girls Aloud, The Proclaimers and Runrig. Ronan Keating said: “We are so delighted to be back in Scotland. We have just performed some of the best shows of the tour in Glasgow, and are really looking forward to playing in Aberdeen and Edinburgh. The ‘Picture of You’ hit-makers wore scarves, leather jackets and hoodies to shield themselves against the dreary Scottish weather. Tourists gathering to watch the famous Gun go off were stunned to see famous five appear from underneath the battlements just moments before the Gun went off. As the Gun was raised to the sky, the group stood huddled together and put their fingers in their ears. And afterwards, Mikey Graham put his face in his jumper to try and escape the infamous smell of the gun smoke. The group, who reformed late last year after splitting in 2000, looked happy to be back together as they laughed and joked with one another throughout their short Edinburgh appearance. Stephen Gately added: “Edinburgh Castle is a beautiful venue to perform at and we’re really looking forward to the show. The band were formed in 1993 by pop svengali Louis Walsh, and have sold over 15 million records worldwide. Last year, the group announced they were reforming after a seven year long split to the delight of fans all over the country. 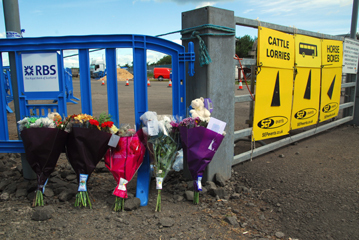 A three-year-old boy was killed after apparently pulling concrete bollard on top of himself as he played at the Royal Highland Show. Onlookers said Ben Craggs was beside the 2ft pillars in the car park when one fell in and landed on him at around 1.30pm yesterday. It is thought the tot had swung on a chain holding two concrete pillars together pulling one of the bollards down on top of himself. Paramedics rushed to the scene and took the tiny child to the Sick Kids in Edinburgh, but he died shortly after from serious head injuries. Ben’s parents, Jonathan and Dawn Craggs, of Sedgefield, County Durham, who were exhibiting livestock at the Edinburgh show, were last night too upset to comment. 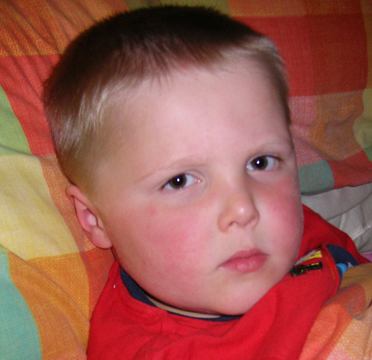 But other family members paid tribute to a “beautiful little boy”. Relative Mary Craggs, of Stockton-on-Tees, said: “It’s an absolute tragedy for all the family. It just seems to be a terrible accident, and he was in the wrong place at the wrong time. “A member of our family spoke to Jonathan this morning and, as you would expect, he is totally devastated. The tragic incident has shocked visitors to the launch of one of Scotland’s most iconic events, expected to attract over 150,000 people over the weekend. Liam McGee, 19, who was working in the event’s car park when the tragedy occurred, said the youngster had been playing alone. He said: “It looked like he was on his own at the time because I couldn’t see his parents anywhere. I didn’t actually see the accident but I was close by. I heard the child was playing between two unattached concrete bollards which were roped together. He pushed the rope downwards and the bollards keeled over and landed on top of him. Another attendant told him he the child had bitten through his tongue – it’s pretty horrendous to think about. The scene of the accident was immediately blocked off with blue fences and tarpaulin and guarded by a solitary policeman. Robert Doig, a security officer at the show, said: “I was near to the scene when the accident happened and rushed over to help. He was in quite a bad way but I didn’t really think he would die. Now Lothian and Borders Police are appealing for witnesses to help them piece together exactly what happened. 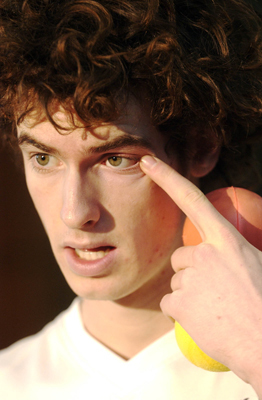 PATRIOTIC Andy Murray has been given the all clear to wear Scottish sweatbands at this year’s Wimbledon championship. Stuffy officials were forced to consult their code of conduct after learning the proud Scot was planning to don saltire-design wristbands. The traditional All England Club has a strict dress code where players have to wear an all-white kit. However last night Wimbledon chiefs confirmed the British number one would be allowed to bear the striking blue wristbands much to the delight of his Scottish fans. Partisan Murray, 21, usually favours playing in an all-blue kit but will be unable to do so at SW19 because of the tight rules. However the Dunblane player will still be able show his Scotland patriotism after officials confirmed he would be allowed to don his saltire wristbands. A Wimbledon spokesman confirmed: “We don’t have a problem with him wearing Scottish sweatbands. “It’s only shorts and tops that have to be predominately white. These are allowed slight flashes of colour but nothing more. “Manufacturers consult with us before the championships start to ensure their kit designs are acceptable. Murray became a hero with the Tartan Army in 2006 after declaring he supports every team who plays against England. Iain Emerson, editor of the Famous Tartan Army Magazine, says he has the full backing of Scottish football fans. He said: “Andy is a great ambassador for Scotland and the fact he wants to show his patriotism is great. “Given the championships are held at the All England Club victory would be all the sweeter. Murray not only has the hopes of Scotland on his shoulders but also the UK being the only British player with a realistic chance of winning the championship. He is desperate to become the first ever Scot to win the men’s title having missed last year’s tournament with a wrist injury. The fiery player has enjoyed a meteoric rise since reaching the third round on his Wimbledon debut in 2005. He went one better the following year reaching the fourth round where he was defeated by the Greek, Marcos Baghdatis. Seeded 12th at this year’s tournament, Murray will avoid the top three seeds – Roger Federer, Rafael Nadal and Novak Djokovic – in the first three rounds. The championships start this Monday. Prince Harry marched through Edinburgh to attend a church service in memory of his hero comrades killed in Afghanistan. The Prince joined 200 servicemen and women during the memorial parade as it was announced that four more troops – including the first woman – had been killed in the war-torn country, taking the death toll to 106. The Household Cavalry officer joined his troops on Edinburgh’s historic Royal Mile ahead of a service at the city’s St Giles’ Cathedral. Crowds of tourists and onlookers applauded as the 23-year-old Royal – who spent 10 weeks fighting Taliban terrorists – made his way to the church service where soldiers were joined by bereaved families and UK Defence Secretary Des Browne. The event was held to pay tribute to the 24 British, Danish, American and Czech soldiers who lost their lives during the deployment of the 52 Infantry Brigade in Helmand Province from October to April. Harry joined 200 soldiers, sailors and airmen led by a pipe band as is weaved its way through the city centre before joining another 400 members of the armed forces gathered outside the cathedral. And joining them were the families of 10 of the 11 British personnel who lost their lives during the tour. Harry’s involvement was kept secret by the UK media but he was removed after ten weeks when news of his deployment was leaked on a US website. Respectful Harry smiled momentarily at the crowds before setting off on the parade. And he even defied his royal rebel nametag the night before – by staying sober on a boozy night out with friends. The Prince sipped on nothing but soft drinks as his friends downed 10 bottles of wine and guzzled cocktails at the city’s exclusive Rick’s bar. Harry and ten of his closest pals laughed and joked as they ran up a £400 bar tab at the trendy bar. But when the clock struck midnight, the Prince was ushered out by his burly bodyguards. And while Harry has become famous for his party hard image, he showed the utmost respect to the fallen heroes in the hours running up to the march. Murray Ward, general manager at Rick’s, said: “We were absolutely delighted to host Prince Harry and his friends at Rick’s. Our sister club Opal Lounge is a bit more used to royalty with both William and Harry partying there when William was in Scotland studying. “Harry wasn’t drinking, he was obviously being sensible about the parade he was involved in. “The group was very chatty and informal and they all seemed to be having a good time. “To anyone who didn’t know they would have seemed like an ordinary group for dinner and there was nothing hush-hush about their visit. The group arrived at the plush Frederick Street bar and hotel just before 8pm on Tuesday and sat down to a two-course meal. Locals drinking at the bar hardly even noticed the down-to-earth prince – dressed in a casual pair of jeans, white shirt and brown gilet – as he sat catching up with his friends. But as the group got tucked into bottles of £18.95 bottles of Firefly Shiraz, Harry stuck to soft drinks and ordered himself three Cokes throughout the night. Polite Harry even got up after the meal to thank bar staff for looking after his group throughout their four-hour stay. And despite being flanked by five bodyguards, the visit was informal and Harry moved around the restaurant himself – including two toilet visits. SHOWBIZ A-listers Keira Knightley and Sienna Miller shared the red carpet with Hollywood legend Sir Sean Connery for the world premiere of The Edge of Love. The movie – which charts the tangled love life of Welsh poet Dylan Thomas – marks the opening of the Edinburgh International Film Festival which Connery is patron of. And the glamorous duo appeared inseparable as they stopped to chat to journalists and sign autographs for fans who had stood outside the city’s Foutainpark cineworld complex for hours. The biopic also stars Welsh actor Matthew Rhys who said filming alongside Miller and Knightley had been “very giggly”. Miller – wearing a black dress by Jasmine di Milo, Louis Vuitton shoes and a trademark black vintage hat – admitted that her role in the movie had not been her most challenging because it had been so well written. The 23-year-old Pirates of the Caribbean star said finally getting to see a screening of the film which was also penned by her mother was a brilliant celebration. And as the young actors stopped to sign autographs, Sir Sean Connery made his way into the screening sporting his arm in a sling. The 77-year-old was greeted by some wolf-whistling from fans and raised a thumbs-up when asked if he was okay. The festival – now in its 62nd year – will run until June 29 and the opening night was also attended by Nip/Tuck actress Joely Richardson who appeared a natural on the red carpet. A TEENAGE jam-making entrepreneur is launching a new charity venture – Super Jam Tea Parties for the elderly. Fraser Doherty, 19, kicked off the first Tea Party in Edinburgh yesterday, and the young businessman has big plans to roll the events out across Scotland. The City of Edinburgh Council has also given its full backing to the charity by providing the venues for the parties free of charge. The charity idea was initiated by Fraser’s paternal grandmother – the same one who gave him the inspiration for the Super Jam – and her work with the elderly and the housebound. He said: “I first got the idea about the Tea Parties from my grandmother. My brother and I used to help her when she organised small tea dances for the elderly in her area. “And since Super Jam took off I always thought it would be a natural progression to do something like this. “I wanted to bring young and old together because a lot of people never have the opportunity to mix. The Scots youngster started out making his sugar free jam in his parent’s small kitchen and soon landed exclusive sales contracts with supermarkets Waitrose and Tesco. He began by producing up to 1,000 jars per week, selling them to neighbours, farmers’ markets and to customers online. And the sugar-free substance is now the top-selling jam in many supermarkets stores across the country selling over 500,000 jars per year – with Fraser on his way to becoming a millionaire. Currently taking a break from studying for a Business Studies and Accountancy degree at Strathclyde University, Fraser has enlisted a team of volunteers to help make the parties go with a swing. Expert knitters have produced 30 different tea cosies for the event, while students from local colleges and universities will be on hand to serve out the tea and scones. Fraser said: “I think it is really important to look after the elderly and I’ve always been conscious about trying to put something back into the community. “And if it is a success, then we’ll hopefully be able to organise events on a national scale. Speaking on behalf of John Lewis Partnership, David Lincoln, a Waitrose branch manager, said how pleased he the company was to be supporting the new charity. He said: “It’s a fantastic idea and Fraser’s business ethos, which is about putting something back into the community, chimes well with our own. Councillor Norman Work, Vice Convener for Health, Social care and Housing for the City of Edinburgh Council, said: “When Fraser first came to me I thought this was a fantastic idea and I am happy that we can use his entrepreneurial ideas to such a good end. “The opportunity to get out and interact with others is very important as you get older and I’m sure the older people will enjoy the occasion. The ex-Royal High pupil hit the headlines last year when his homemade health jam business was awarded the Global Student Entrepreneur Award in Chicago – a competition that saw him beat 750 students from around the world to the prestigious title. KEIRA Knightley and Sienna Miller brought a touch of glamour to Edinburgh Castle ahead of the world premiere of their new movie The Edge of Love. The A-list pair were joined by Keira’s Glasgow-born mother Sharman MacDonald – who penned the script focusing on the tangled private life of Welsh poet Dylan Thomas, played by Matthew Rhys. And Keira was quick to deny that a breast-baring scene in the all-British film was in any way embarrassing to shoot in front of her mum. The Pirates of the Caribbean star said she had no doubt about taking the part when she first read her mother’s script. And she revealed how her mum first showed it to her when she was in Glasgow filming The Jacket. But her writer mother admitted that she originally thought her daughter would play the role of Caitlain MacNamara – the other female lead played by blond superstar Sienna Miller who wore a black and white striped mini-dress. The two leading ladies giggled and touched each other on the arms during the press conference in Edinburgh Castle’s Queen Anne room. And Knightley – wearing a stylish floral print dress – was in a jubilant mood ahead of the world premiere screening at the city’s Foutainpark cineworld complex. The pair faced questions from journalists along with co-star Ryhs, director John Maybury and Rebekah Gilbertson – the granddaughter of Knightley’s character Vera Phillips. Asked if she felt particularly Scottish, Knightley proudly took her Glasgow-born mother by the hand and said it would be difficult not to. Joking aside, Knigtley said that although she was proud to be associated with her mother’s work, she did not feel any heightened responsibility to make it a success. The Edge of Love premieres tonight at a red carpet gala opening night for the 62nd EIFF which has moved away from the traditional festival month of August for the first time.